The end of July marks the beginning of what has become an annual tradition in the Tennessee blogosphere (yes, I believe two years running = a tradition). What am I talking about, you may ask? Why, the Big Orange Roundtable, of course! The Big Orange Roundtable is a conglomeration of the biggest, baddest, boldest Tennessee blogs on the net. Most of the participating blogs are returning from a very successful inaugural campaign last season, but others are just joining in on the fun. Luckily, bleeding orange found themselves a golden ticket, and are now heading to the Willy Wonka Chocolate factory of roundtables. The format is thus: each of the participating blogs takes its turn to host the roundtable, proposing a set of questions that each of the other blogs will answer. The host blog will then publish a sort of review, hitting the highlights of each blog’s answers. This process will get us through the rest of the offseason, and will come to a conclusion at the perfect time: the start of the Tennessee football season. 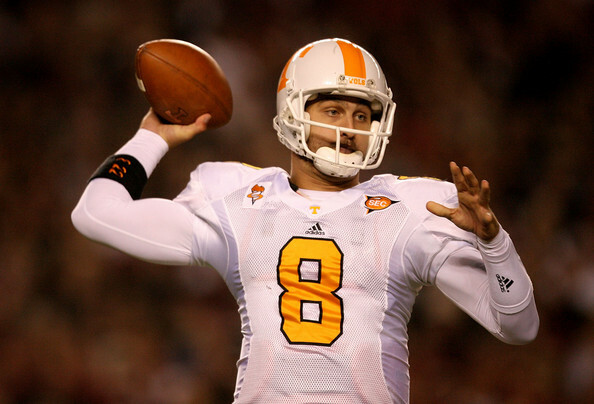 This week’s host blog is Moondog Sports, who is kicking things off with some tough questions about the most pertinent thing on Vol fans’ minds: the 2009 season. 1. In my mind, this season’s success – or failure – centers around one man, Jonathan Crompton. What is your opinion of Crompton’s ability to run Lane Kiffin’s pro style offense? Can Crompton overcome his miserable 2008 season and lead the Vols to a winning record? Oh, the downward spiral that has been Jonathan Crompton‘s career. A once highly touted prospect who was ranked higher in his senior year of high school than many of college football’s most recent quarterback successes, including Colt McCoy, Crompton has, for lack of a better term, blown. As other young men cemented themselves in their alma mater’s history books, Crompton has been doing his best to cement himself in the minds of Tennessee fans as one of the biggest busts to ever don the Volunteer uniform. Biggest busts in the history of Tennessee football? This kid has had to endure more than most people realize. He’s had three offensive co-ordinators in the last three years, which is more than Peyton Manning has had in his entire career. To make matters worse, Crompton’s most recent offensive co-ordinator was Dave Clawson, inventor of the infamous Clawfense that has caused so much agony over the past year. In my opinion, Crompton has always had the skills he had when Rivals ranked him in their Top 100 and second among pro-style quarterbacks (behind only Mark Sanchez) back in 2005. Crompton’s only problem is he hasn’t had the stability to showcase those skills. Learning an offense is a sizable task, and is one reason why many highly touted prospects spend a year or two on the bench before being handed the keys to the offense. In Crompton’s case, however, he’s never had the chance to get settled in an offense, and so he’s never been given the chance to blossom. The biggest asset for Crompton in 2009 are his coaches, who are undoubtedly doing all they can to assure this young man can lead the Tennessee Volunteers back into the national spotlight. They will do this by slowly building up Crompton’s confidence, which was undoubtedly at an all time low last season, in which he struggled on the field and received death threats off it. Expect to see a lot of passes out into the flat to new additions David Oku and Nu’Keese Richardson to start the season. Once he’s established the short pass and built up his confidence, Crompton can shift to throwing the long ball to some of his established receivers, like Gerald Jones. With a huge frame and a gun-slingers arm, Crompton’s mentality is the only thing holding him back, and will make or break his 2009 season. 2. Last season, the kicking game was mediocre at best and the special teams – especially the punt coverage unit – was a disaster. Daniel Lincoln returns as the kicker and Chad Cunningham will return as the punter. What are your thoughts about the Vols kicking game and special teams? Like the rest of the team, special teams really struggled last season. Fans watched as opposing teams ran back numerous punts for touchdowns, while at the same time gawked as kick after kick went wide of the goal posts. Yes, the special teams were abysmal last season. And in a conference built on speed, special teams are where many games are won and lost. So, Tennessee must make sure that, in 2009, they excel in the special teams category to ensure the season ends in success. To help matters, the Vols were fortunate to bring in Eddie Gran, who put together solid special teams groups while coaching at Auburn. What we must hope is that Gran can bring the same success on the field as he has on the recruiting trail. If he can, I expect the special teams to improve greatly. Either way, I can’t wait for Michael Palardy to suit up in 2010 and bring a much needed boost to a less than stellar kicking unit that could use his help in 2009.
your thoughts regarding the offensive line for 2009? Tennessee’s “supposed” veteran offensive line was one of the biggest disappointments last season, as a group that was expected to be dominant at the line ended up conceeding twenty-five sacks. A lot of the blame can be shifted to other players, such as the quarterback and the receivers, but at the end of the day, this line just didn’t produce like it was supposed to. Many of their struggles can be attributed to the Clawfense (notice a trend here?) which preached that each lineman should be able to play every position. Their new scheme under Kiffin, however, has moved away from this complexity, and so each lineman can go back to playing their natural position, and hopefully thriving at it. Look for this unit to return to their 2007 form, in which they allowed only four sacks over the course of the season. Their success will undoubtedly bleed over into the rest of the offense, allowing the quarterback more time to hit his receivers and opening holes for a running game which should flourish with established veteran Montario Hardesty and newcomers Bryce Brown and David Oku in the backfield. team expected to perform much better. How do you believe the Vols will finish in 2009? This year is a year of new beginnings for a Tennessee program that has undergone quite a bit of change over the last year. But change is a good thing, and a program that has become stagnant over the past decade will hopefully start its trek back into the minds of fans, coaches, and the media nationwide. This isn’t an overnight process, and most Volunteer fans know that. It’s a slow process, but with the staff Tennessee has put together and the players they’ve already brought onboard, the sky is the limit for how talented this team can eventually become. There’s no doubt that the upcoming schedule is a daunting one, but with eight of the twelve games being played in Neyland Stadium, the Vols have every opportunity to end 2009 with a winning record. If they can get out of the gate strong, with wins over Western Kentucky and UCLA, there’s no doubt the team will go into their matchup at the Swamp with all the confidence in the world. However, I don’t expect the Vols to knock off any of the top three (Gators, Tide, or Bulldogs), but games at Ole Miss and hosting Auburn will likely be the deciding factor as to whether or not this team succeeds or fails. Look for Tennessee’s 2009 campaign to end on a high note, with the Vols getting back into the bowl picture, but don’t be surprised if you’re celebrating their victory before the start of 2010. Unless, of course, they make it to the Liberty Bowl. Alright ladies and gents, that’s all she wrote for the first week of the Big Orange Roundtable. Hope my answers were respectable, and didn’t offend/enrage too many of you. Feel free to put in your two cents in the comments. Feedback is always appreciated. I love to hear what other Vol fans think, especially if they think I’m wrong. ~ by drewbd on 07.16.2009. Excellent answers one and all. I couldn’t agree more with your assessment of Crompton. What worries me is the fact he’s trying to learn yet another offense, and to this point he hasn’t shown the ability to acclimate very quickly. If Crompton gives us an average performance throughout the season, that’s a huge step forward from last year. We have enough playmakers on both sides of the ball and I agree that Gran will improve the special teams. I just want to see passion and heart from the team, something that was lacking in the recent past. If we win eight games, I’d consider that a step in the right direction. My thoughts exactly. With the season Crompton & Co. put together last season, anything better than awful will be an improvement. As long as he or Stephens and cut down on mistakes, our running game should be able to take on an increased workload. But unlike last year, the QBs must be able to make at least a few plays, or our opponents will again just stuff the box. To me, eight wins really does seem like the magic number for this upcoming season.